Contrary to popular belief, your printed shirts don't have to be reserved for tropical vacations. The printed shirt has its place in day-to-day wear, especially on a hot summers day. I say this all the time, but favourite season to dress for is fall. It's perfect for layering and adding a little complexity to my looks. Summer, in my opinion, gives people the option to be too simplistic. A fun way to break up the monotony of white tees and chino shorts is with the printed shirt. 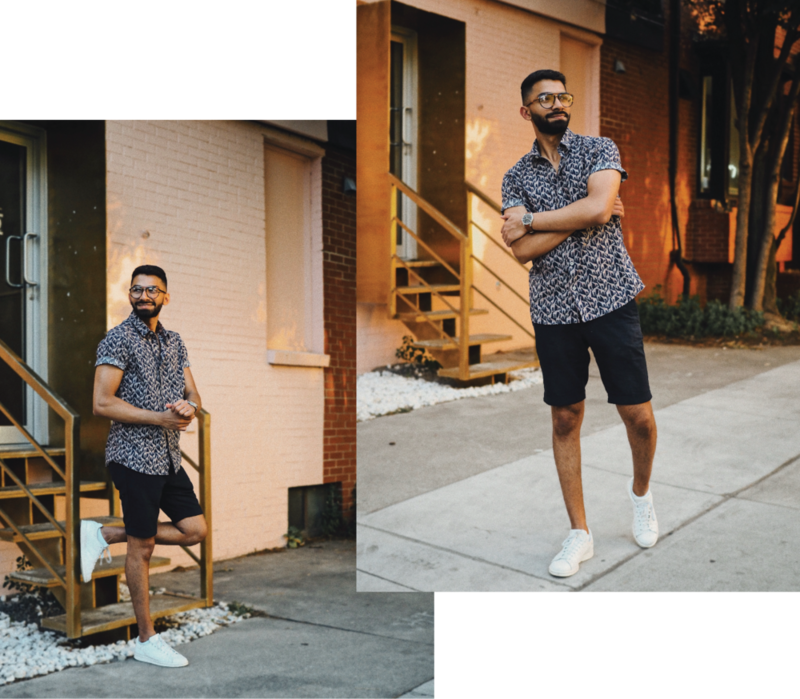 Different prints work for different occasions, so I pulled out three of my favourites that I think work while we savour the last sweltering weeks of summer. In my opinion, some men stray away from the floral prints because they can seem overwhelming, but they don't have to be. With a little digging, it's easy to find something fun and different that works in your comfort zone. 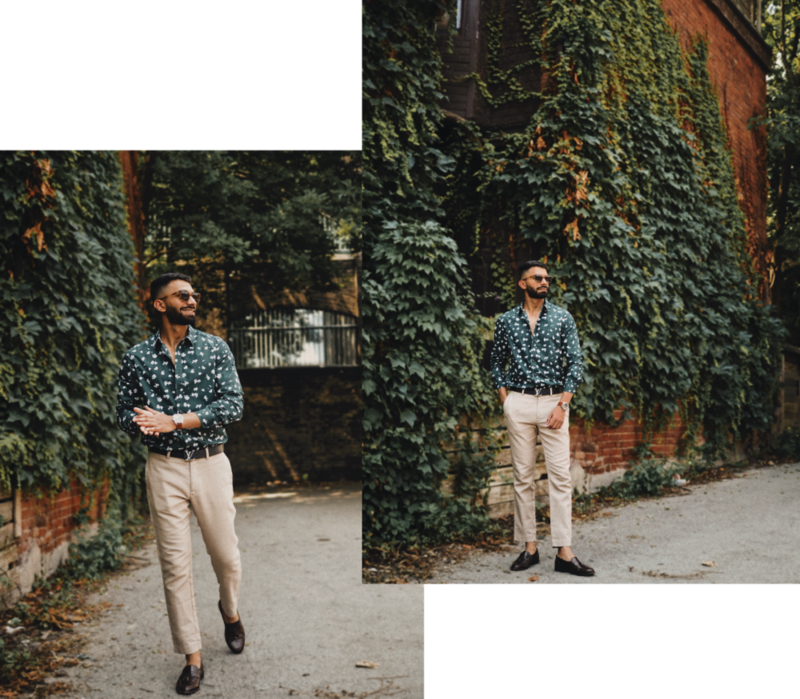 This seaweed green Club Monaco shirt is a great evening option - there's colour but it's muted, and I used neutral trousers and a dark shoe to balance out the entire look. The result is a fun evening look that isn't trying too hard. Bingo! I don't think we need anymore proof that the dad look is back, but the Hawaiian shirt makes it pretty official. This tropical H&M number is the epitome of refined dad. The tailored fit is a departure from the classic XXL your dad wore on family vacay, while the cuffed sleeve and tuck give your body structure and definition. I matched my trousers to the the green tones in the print to create a little congruence, and finished the look off white a classic white sneaker. Casual summer evenings done right. A whimsical print is just that - fun! It's a great opportunity to show off some personality and take a little risk with your look. This short sleeved giraffe print shirt from RW&Co has a fun side to it, but balances out well with the navy blue base. Pair with matching shorts and tennis whites, and head out the door for an easy ensemble that gives your pima cotton crewneck a break.